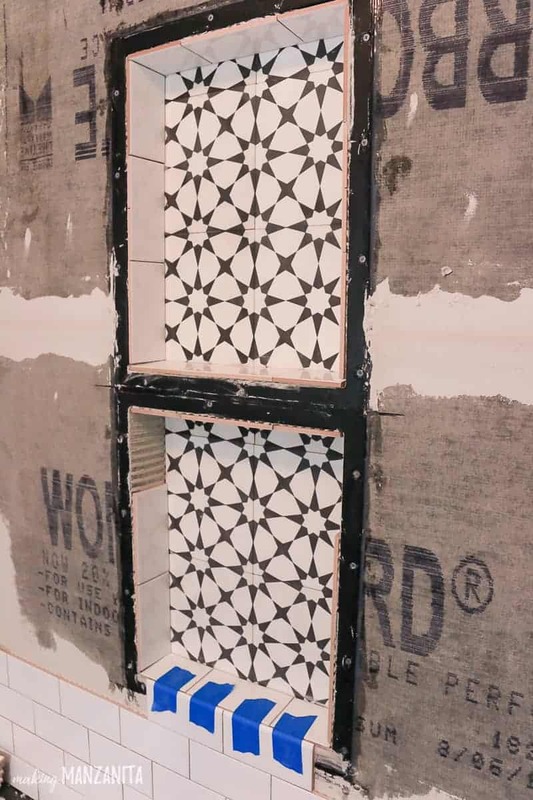 If you’re going to be doing DIY shower tile installation, you need to read this post. 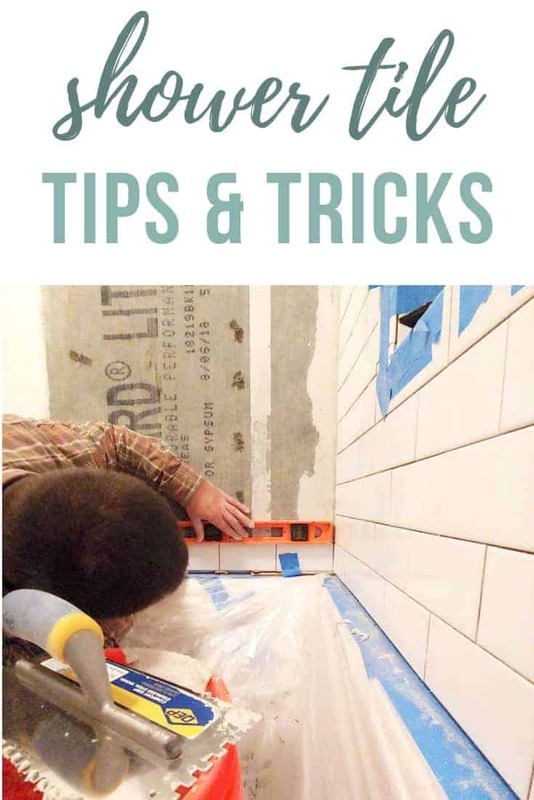 It’s full of tips and tricks of how to tile a shower, including how to waterproof a shower and apply shower caulk! 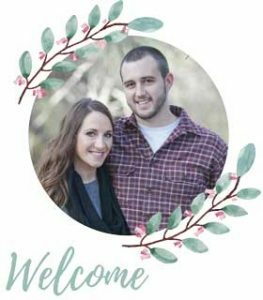 Thank you to DAP for sponsoring this post! All opinions are entirely my own. This post also contains affiliate links, but nothing that I wouldn’t recommend wholeheartedly. Read my full disclosure here. 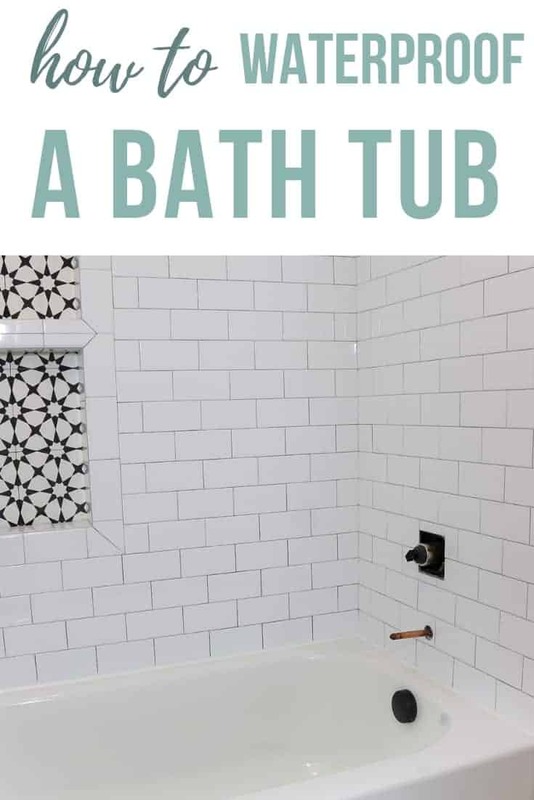 Last week we talked all about how to tile a floor and now we’re back with more lessons from our bathroom renovation. 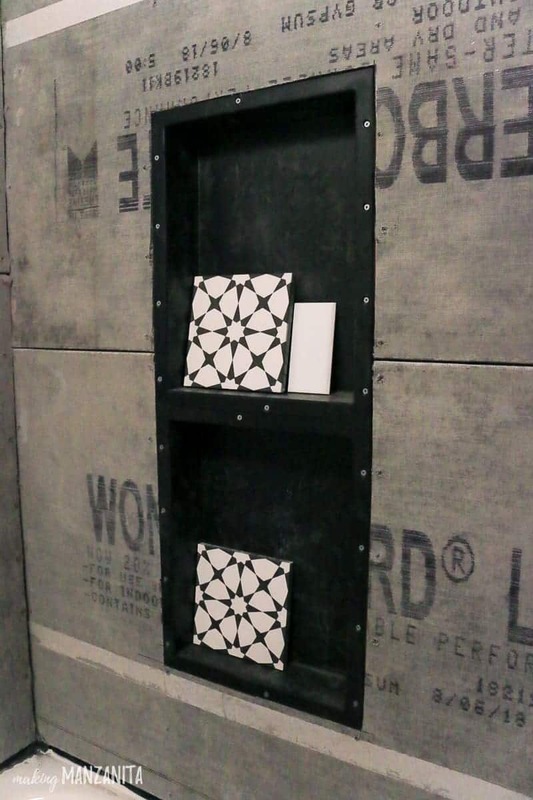 We’re still talking about tile today, but this time it’s all about shower tile installation. So, you think you wanna tile a shower? Let me tell you, this DIY project is not for the faint of heart. You will be working long hours and late nights. Keep the pizza guy on call and the coffee on tap! Although shower tile installation is a rather labor intensive project, you can definitely save a TON of money by doing this yourself. 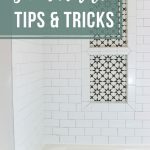 Do your research and make sure you understand the in’s and out’s of shower tile installation and especially how to waterproof a shower – which is probably the most important part. How to waterproof a shower? During your shower tile installation, you definitely want to be sure you are going to waterproof your shower. We accomplished this by stapling a visqueen barrier directly onto the studs underneath the cement backer board. This protects the interior wall if water were to somehow get behind the tile, thinset mortar, and the backer board. We stress here….somehow. If your shower tile is installed correctly, it’s very unlikely that water is going to get back there. However, it could cause a world of issues if it does, so you want to be sure you create a waterproof barrier…ya know, just in case. As an additional safety net to waterproof a shower, you can also add DAP Silicone Max over the screws on the backer board. This helps waterproof where the cement board was compromised. 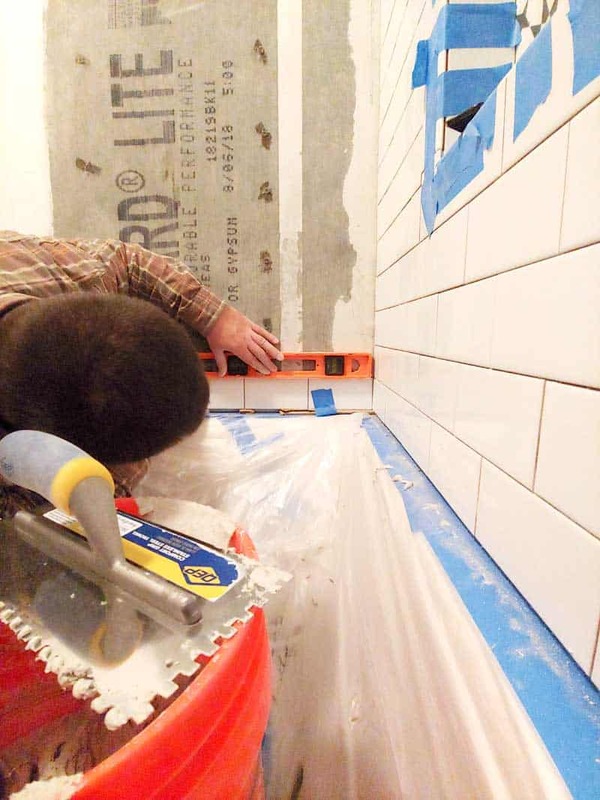 Why do you use cement backer board when doing shower tile installation? When installing tile, you need a backer that is going to accept the thinset mortar, which is how your tile will adhere to the wall. You also need something that is designed for wet places…because I don’t know if you’ve noticed, but showers are wet! 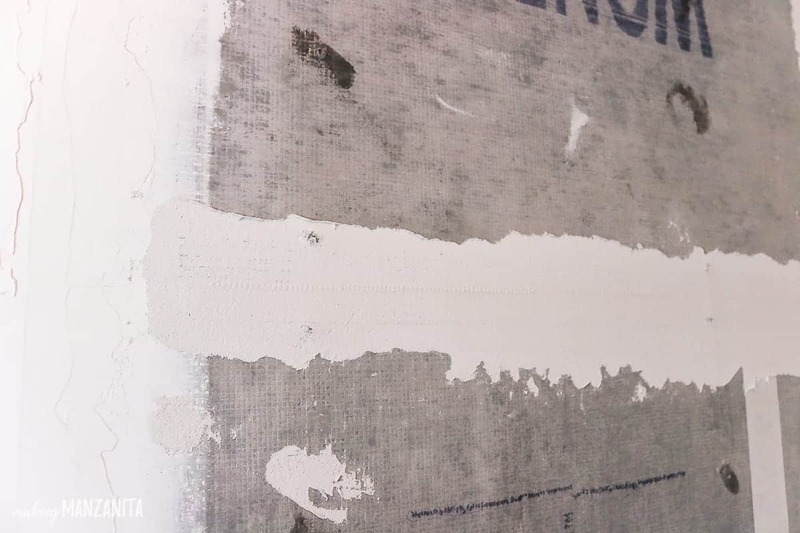 This great article from Floor Elf mentions that although cement backer board is not “waterproof” per se, it is “dimensionally stable when wet” – aka it won’t swell up. Cement backer board also provides a great surface for the thinset mortar to grab on to because it has a mesh mat. You may be wondering if you can just use greenboard when doing shower tile installation. Spruce.com does an awesome job explaining just what “greenboard” is here. You’ll find that, although greenboard is ok for damp areas, it’s not a good idea to use it on shower walls that are subjected to a ton of water. How do you attach the concrete backer board? 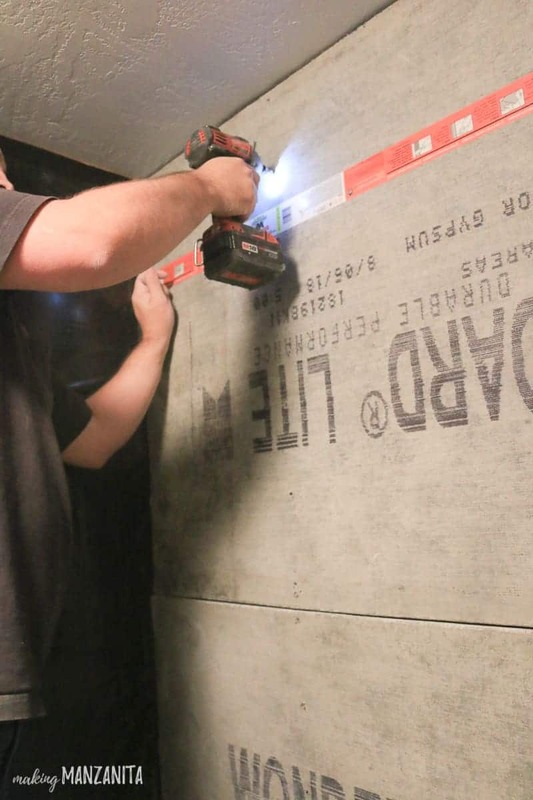 After you get your visqueen barrier stapled to the studs, you can attach the cement board using cement board screws where the studs are located and space them out every 6-8 inches. Start your first cement board screw within 1/2” – 2 1/2” from the edge of the backer board (per manufacturer instructions on the Wonderboard we used). 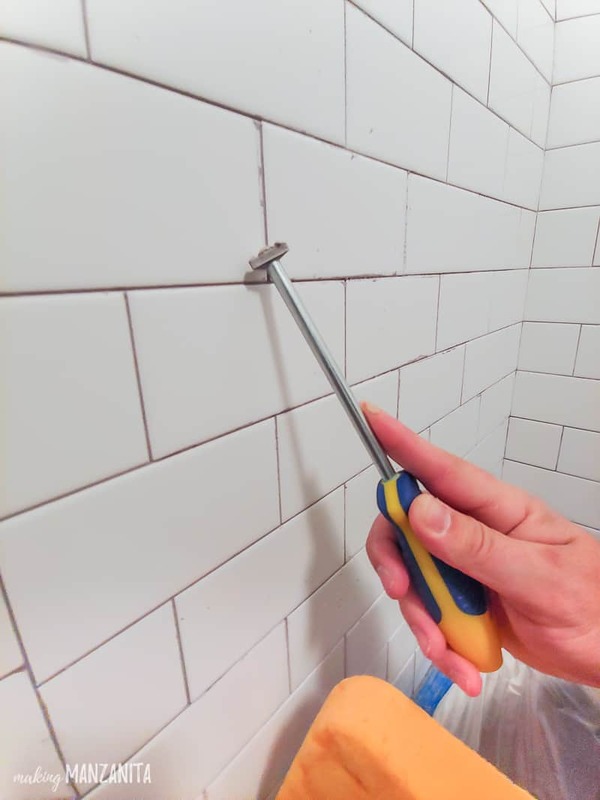 Like I mentioned earlier, if you want to waterproof a shower – you can then go over the areas that you added the cement board screws with a dab of DAP Silicone Max. How do you handle the seams of cement board when doing shower tile installation? 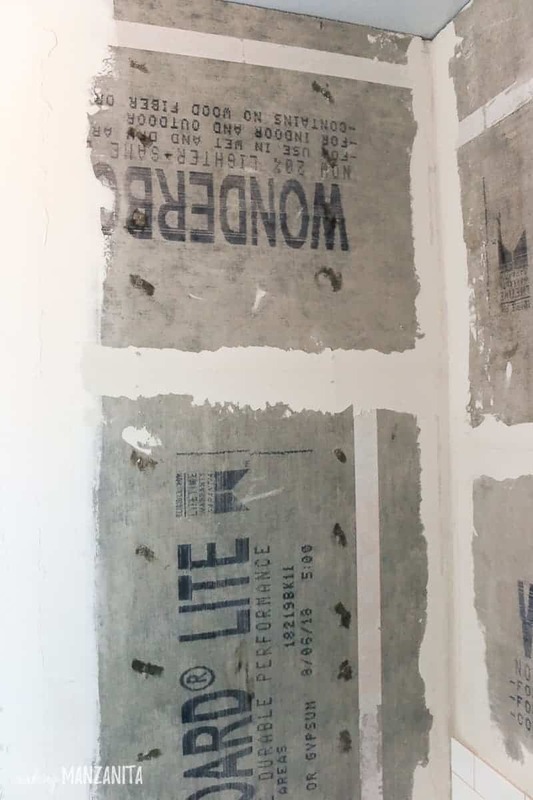 You definitely want to cover all of the corners and seams of the cement board in the shower with cement board tape and then cover with thinset mortar using the flat side of your trowel. This is a good way to bond the two boards together so there is a stable back behind the tile. You don’t want those boards shifting at all once your tile is set, which could lead to cracking. 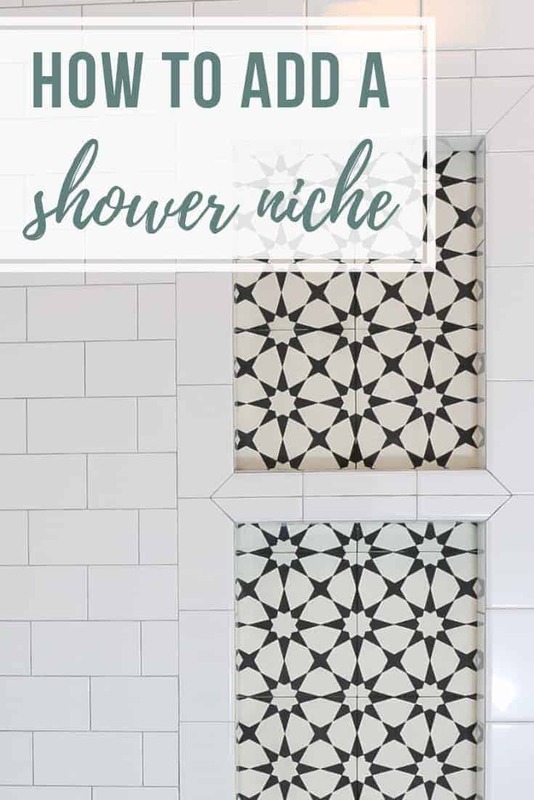 When you are selecting your shower tiles (if you need some good modern farmhouse tile ideas, you’ll love this post), keep in mind that the smaller the tile is — the harder the job. Your shower tile size correlates directly with how intense your shower tile installation process will be. 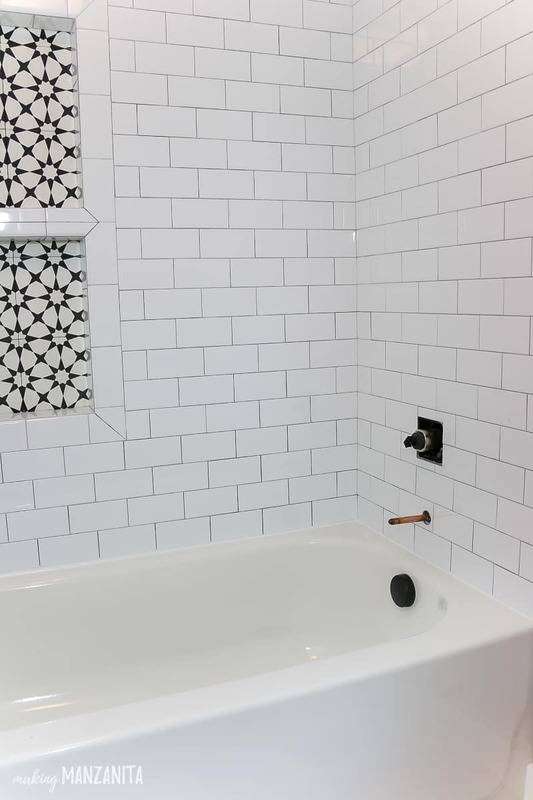 Much to my husband’s dismay – I love the look of classic white 3×6 subway tile. So, we had a big job ahead of us. If you have your heart set on a smaller sized tile look, consider purchasing the tile in mosaics – which means that they will be grouped together on a mat, which makes it a little faster to install. You can see that our floor tile in this post was a mosaic. Possibly one of the most important parts of your shower tile installation is making sure things are nice and level. 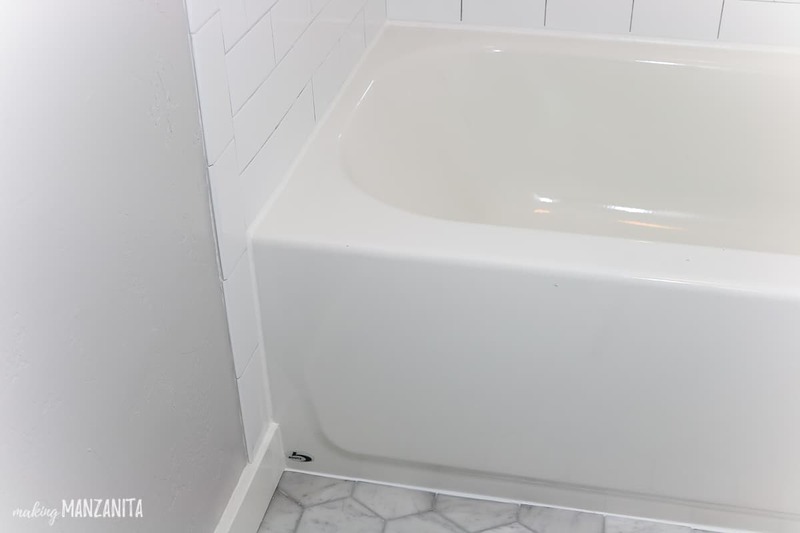 If you’re installing tile above a bathtub, like we were, you also need to make sure your bathtub is perfectly level. Lastly, be sure that the walls are square. The bottom row of tile needs to be perfectly level, take your time on this one. Continue working way up the shower with the tile. We used a prefabricated shower niche insert that was pretty easy to install. All you do is place in between your studs and screw in. 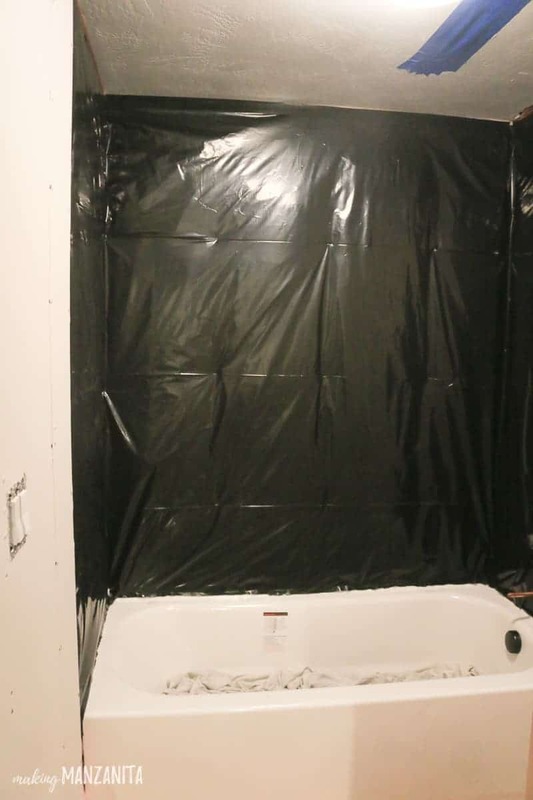 To make sure that your shower niche is waterproofed…. 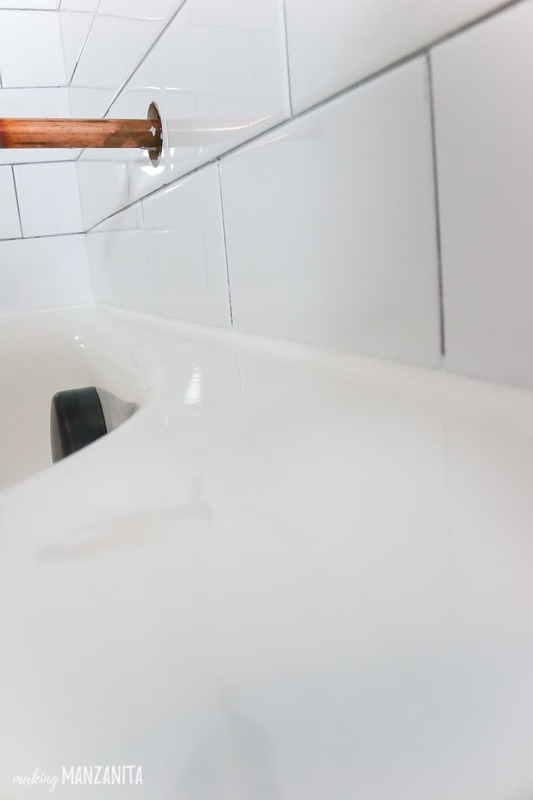 (remember your goal here is to waterproof a shower), you will want to add DAP Silicone Max along the edges of the shower niche and in the screw holes. One of the reasons to use a prefabricated shower niche like the one that we used is that most of them are designed in a way so that the water doesn’t sit in the shelf, the bottom of the shelves are slightly angled so the water falls out nicely, rather than puddling and causing problems later down the road – which is definitely important if you’re trying to waterproof a shower. 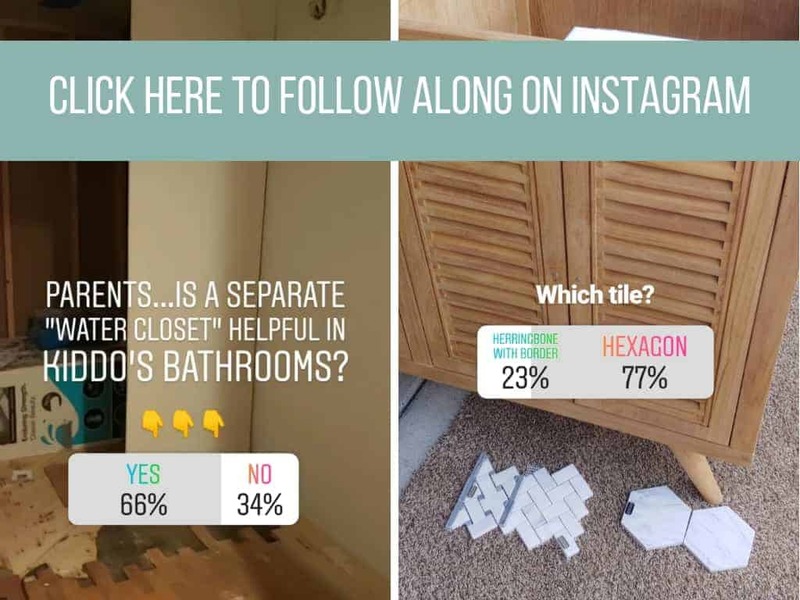 If you follow along on my Instagram stories, you know that the shower niche tile took us a LONG time. A lot of the hold up was figuring out how to border the tile around the outside of the niche. I wanted something very specific (a picture frame border around the shower niche), which ended up taking us extra time to plan the tile cuts out and make sure the seams were going to line up accurately. Our brain seriously hurt after we got it all planned out. I think my favorite part of the entire bathroom so far is our cute little shower niche. 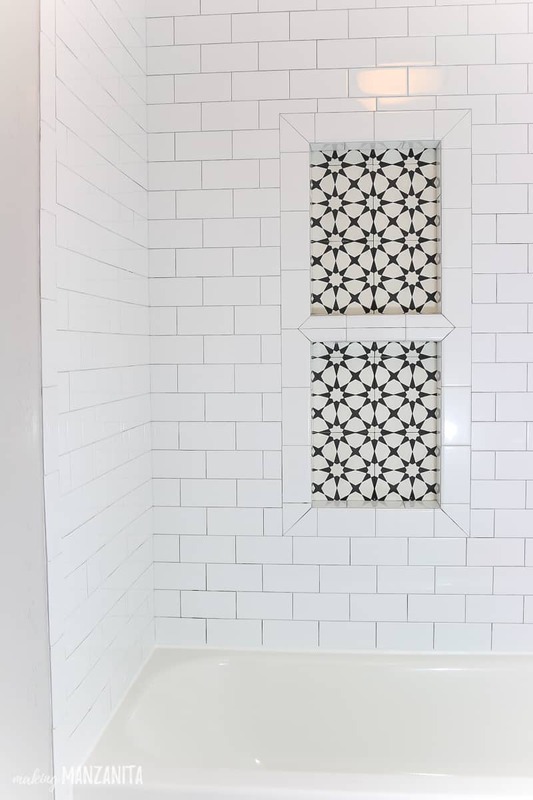 The cement tile on the back of the shower niche adds so much character, don’t you think!? After your shower tile has been installed, wait 24 hours and then it’s time to grout. 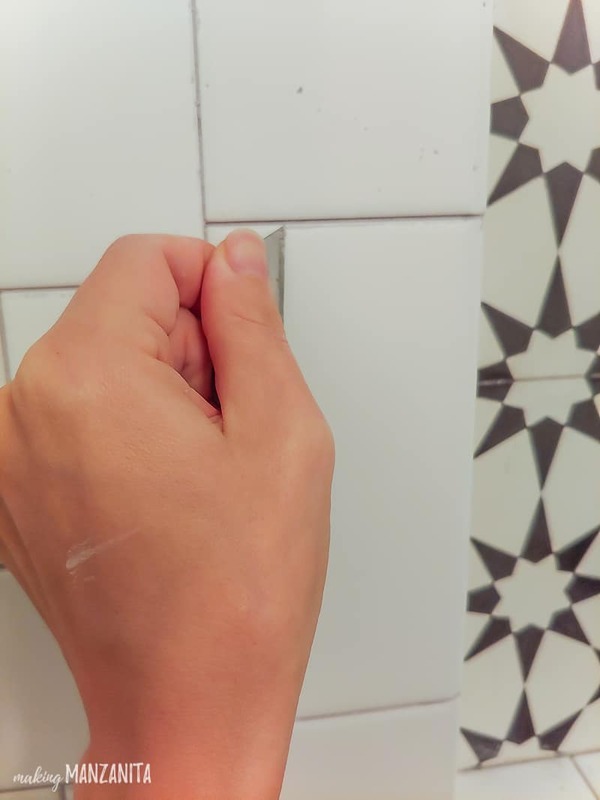 It’s really pretty easy to grout tile, you just spread it over the tile and push the grout down using a rubber float held at 45 degrees so it gets in all of the gaps in between the tile. Then wipe clean with a wet sponge. **Be sure you read the manufacturer’s instructions for how long you should let the grout set before wiping with a wet sponge. ** We thought 10-20 minutes would be fine and we could come back and wipe it off (just like we had done on our tile floors last week), but NO CAN DO. This stuff had hardened by the time we got back to wiping it off. What to do if your grout hardens too quickly before you wipe it off? I’ll spare you the drama, but we almost missed trick or treating on Halloween night because Mom and Dad were trying ferociously trying to clean grout off of the tile…meanwhile baby was tired…and hungry…and crying…and our toddler was getting babysat by the T.V. and wreaking havoc all over the house. Ok…so I didn’t spare you all the drama. That’s a fair amount of the drama that was involved. ALLLLL that to say, we ended up having to come back and scrape the grout of the tiles later and it was a super tedious process (about 3.5 hours of both of us working on it), but well worth it because….man, those tile lines are lookin’ good now! Logan used this handy grout removal tool to just scrape the hardened grout off of the tile and clean up the grout lines, while I used a razor blade. 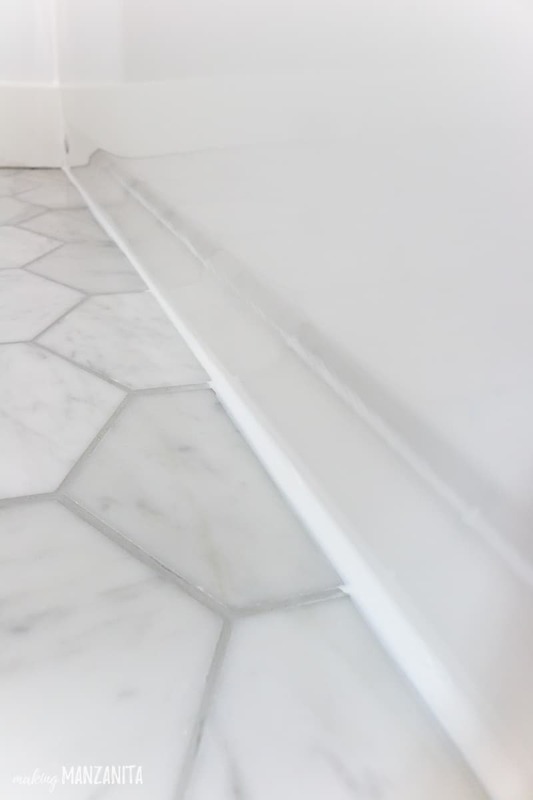 At this point, you want to take a look at your grout lines and make sure they are nice and clean. 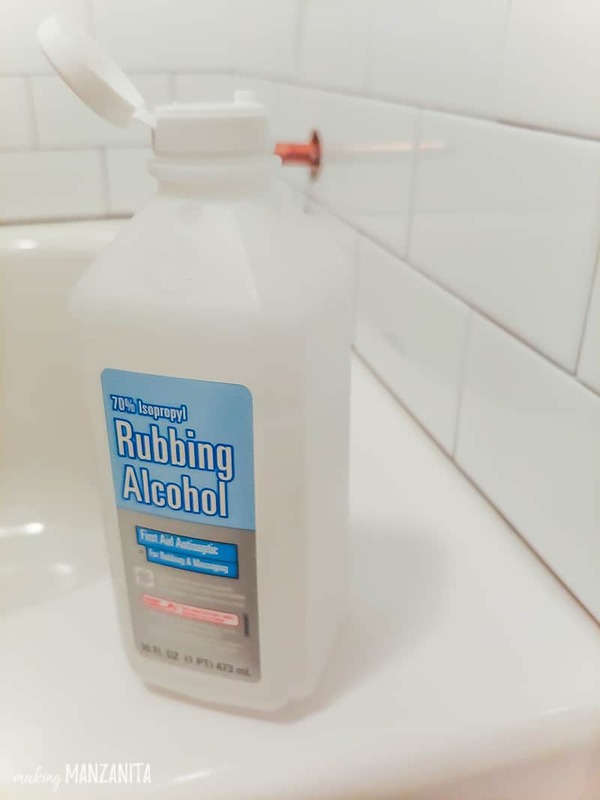 Fix anything as necessary, then wait at least 2 hours and wash the grout haze off of the tile with a grout haze cleaner (or just use distilled white vinegar mixed with water….roughly 3 parts water, 1 part vinegar). Make sure the area you’re going to seal is clean and dry. We would recommend applying rubbing alcohol to the seam to remove any residue. It’s a good idea to add painter’s tape to both sides of the seam before adding the shower caulk. This will give you nice crisp lines. Cut the nozzle of the Kwik Seal Ultra caulk at a 45 degree angle and load into your caulk gun. 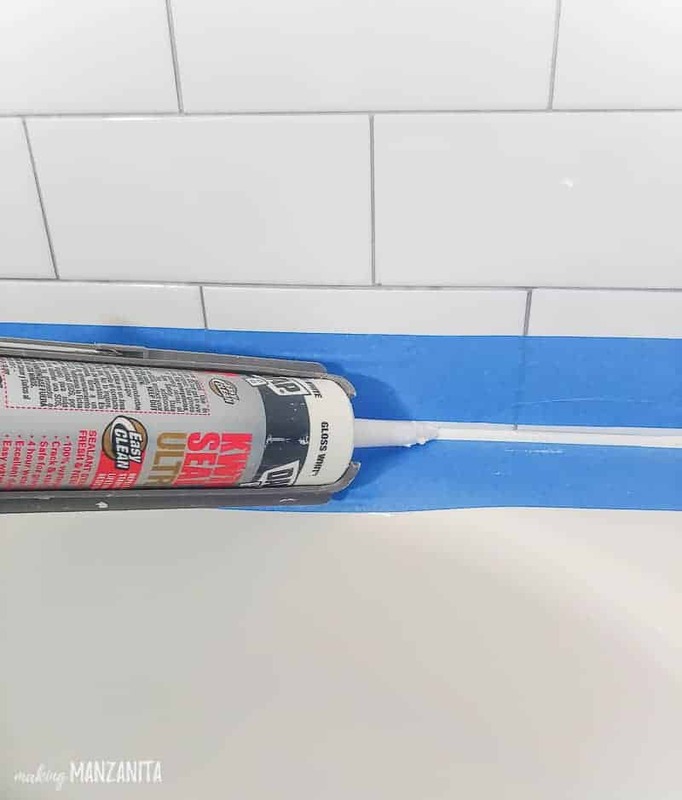 Hold the caulk gun at a 45 degree angle to the joint and gently squeeze the trigger with steady pressure to apply an even and consistent bead of sealant. Move the caulk gun slowly and steadily, filling the joint with sealant. 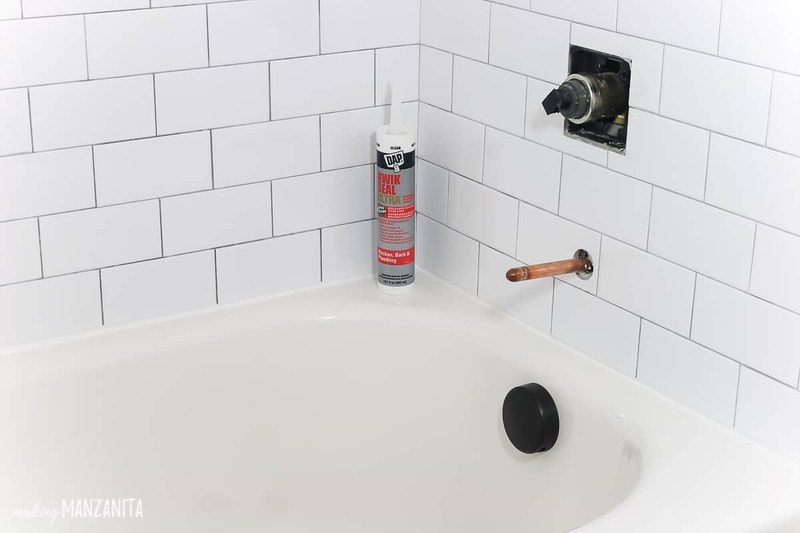 Immediately after adding the caulk, smooth the bead of shower caulk with your finger slightly wet or you can grab a caulk finishing tool. 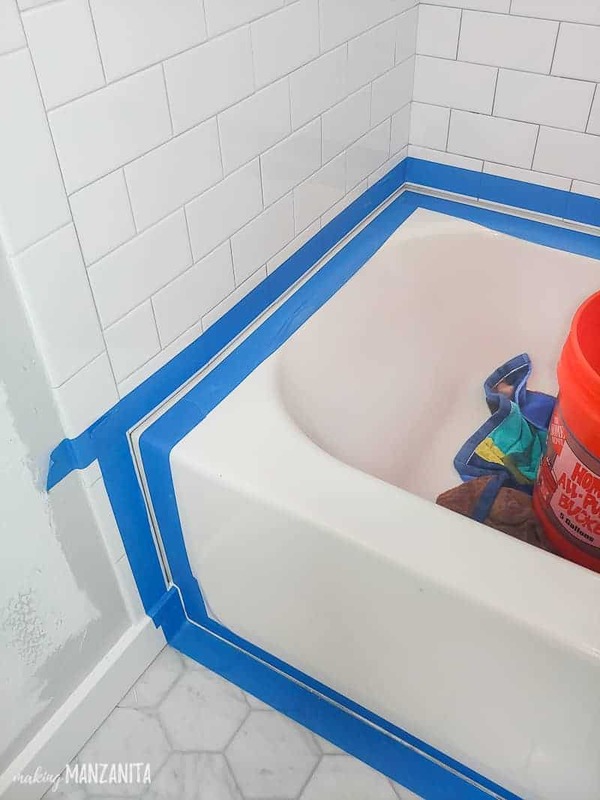 Be sure to remove the tape while the shower caulk is still wet. 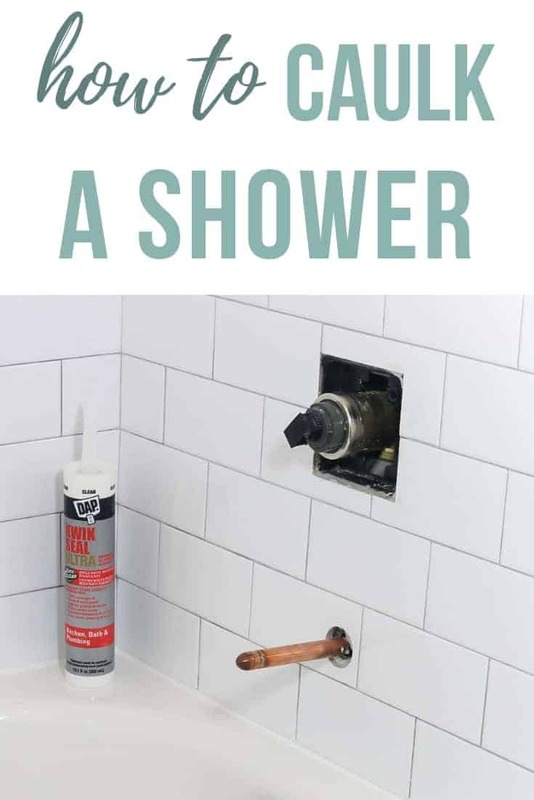 Where do you add shower caulk? 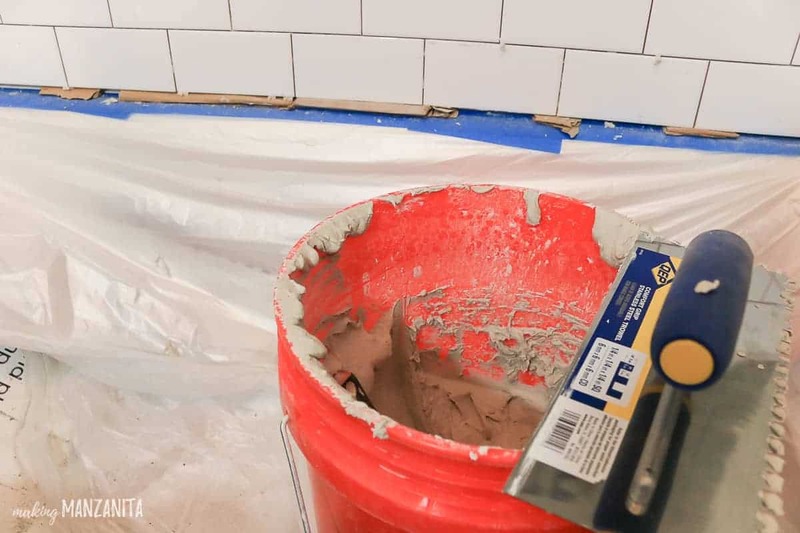 When adding shower caulk, be sure to get any joints or corners. Where the bath tub meets the tile wall, where the bath tub meets the tile flooring, all corners, ceiling and in all corners of a shower niche. 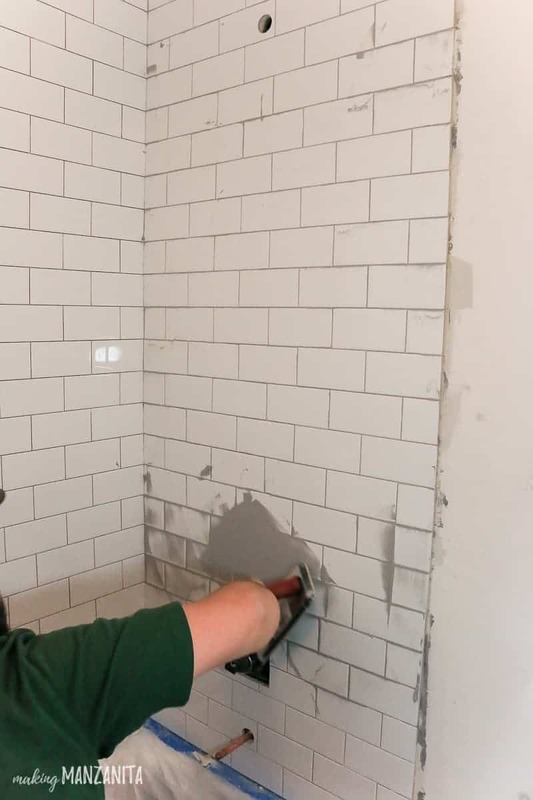 As you can see, shower tile installation is a pretty labor intensive home improvement project, you can definitely save a TON of money by doing this yourself if you’re willing to take your time and do your research. 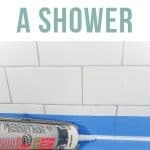 Hope this post helped you understand some of the in’s and out’s of shower tile installation and especially how to waterproof a shower and apply shower caulk, which are two super important aspects of shower tile installation! 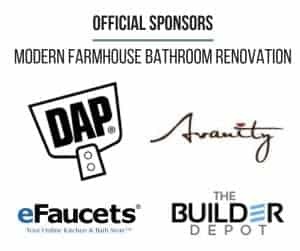 Ready for our modern farmhouse bathroom renovation update of the week?? First of all, let me remind you that we’re sharing the renovation as part of the One Room Challenge, which is a bi-annual event where hundreds of bloggers join together to renovate one room in their home and share about it over 6 weeks. Be sure to check out all of the rooms getting renovated here. One Room Challenge Week 5: you are here! 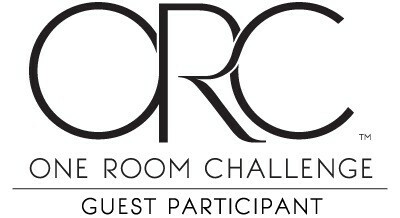 Well, we’re at the finish line of One Room Challenge! I can’t BELIEVE there is only one more week left. We are down to the wire and every day counts at this point. We have a clear plan on how to wrap everything up in time….now we just have to keep our fingers crossed that all goes as planned. We’ve had a more than a few VERY late nights recently as we have been working on the tile wall above the vanity and the entire shower tile installation. As I mentioned above, the shower niche really slowed us down a bit. And then there was, of course, the great grout drama of 2018. To do list for the rest of the week is pretty full with installation of the toilet, all accessories, lights, faucets, mirrors….and then he’ll (ya know as Chip would say…) “pass the baton” to me to decorate. I’ve got high hopes that I’m going to miraculously have time to create some DIY frames and wall art as well…I’ve got the plan in my noggin’, now I just gotta get the supplies and find some time! Lay tile floors Learn how to tile a floor here! wow that’s a great tile tutorial!! I have never tried tiling myself before but now that’s an inspiration! love a crisp white bathroom. can’t wait to see the finished room next week! Thanks….Fingers crossed that we can finish in time! Thanks Susie! It was a huge project to tackle, but I’m so glad all that tile is done. Wow those tiles look amazing, so fresh and crisp! Looking forward to your reveal! It was a very educational project! I never thought I could do a bathroom, but it turned out better than I expected.